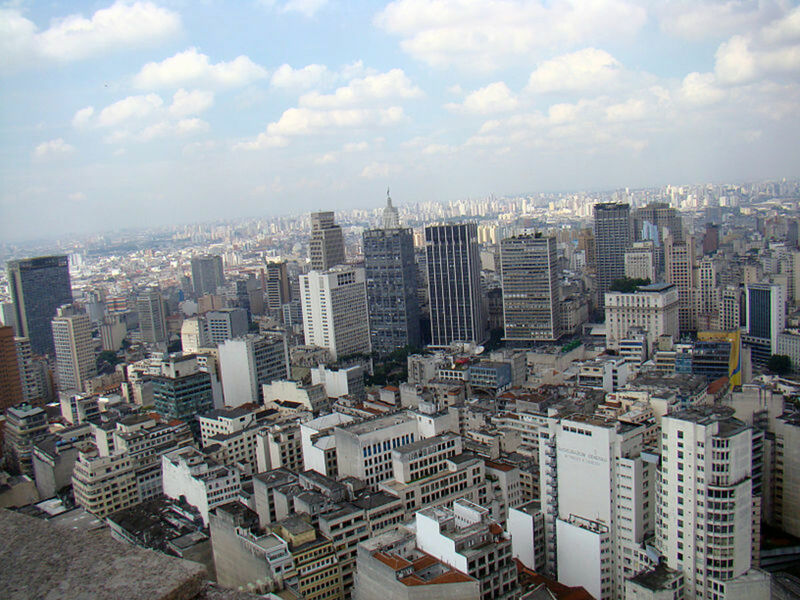 Sao Paulo is the largest city in Brazil, a sprawling monster with up to 15 million inhabitants. If you're thinking of paying a visit you'll need all the help you can get believe me! 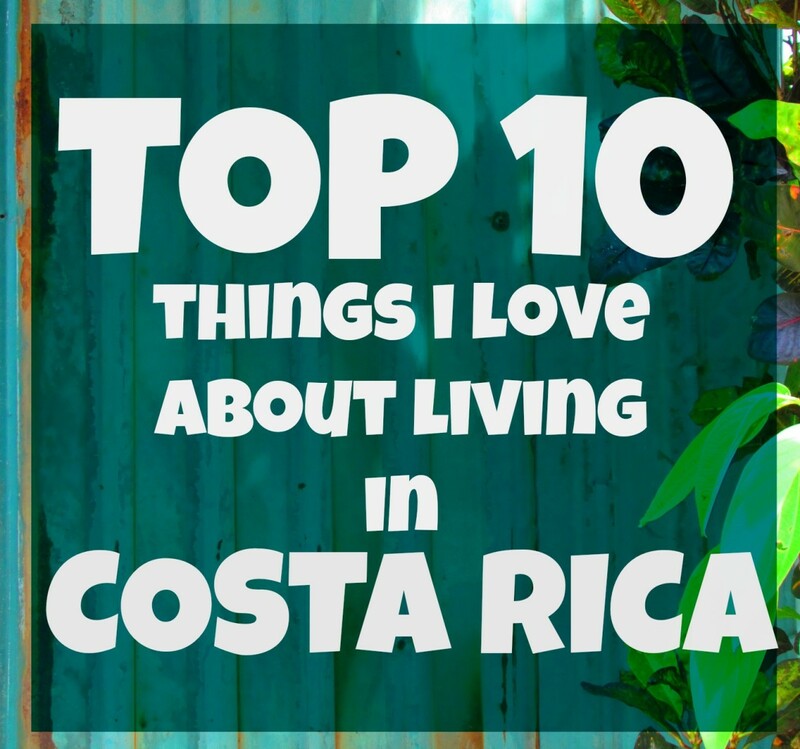 On the other hand because of its size there are plenty of fun things to do and interesting places to see. OK, it's not the prettiest of cities, there's too much bare concrete, crazy traffic pollutes the air and high rises clutter the horizon. But the sky is blue for days on end, the parks are clean and the people are mostly hard working and ready with a smile. And it has a relatively unknown gem of a wild forest only 10 km from the centre! . On a recent visit to Sao Paulo I was lucky enough to stay with a friend for a whole 3 weeks, sharing an apartment in a place called Barra Funda, close to a relaxing local park. In that time I got to know this sprawling city really well, learning how to use the great Metro system, getting to where I needed to go with the least hassle. Naturally having a local guide is best but if you haven't that luxury I hope the following information - along with tips and advice - serves you just as well. There are loads of things to do in this great city but I recommend you avoid areas you're not sure about and always ask if you get stuck. 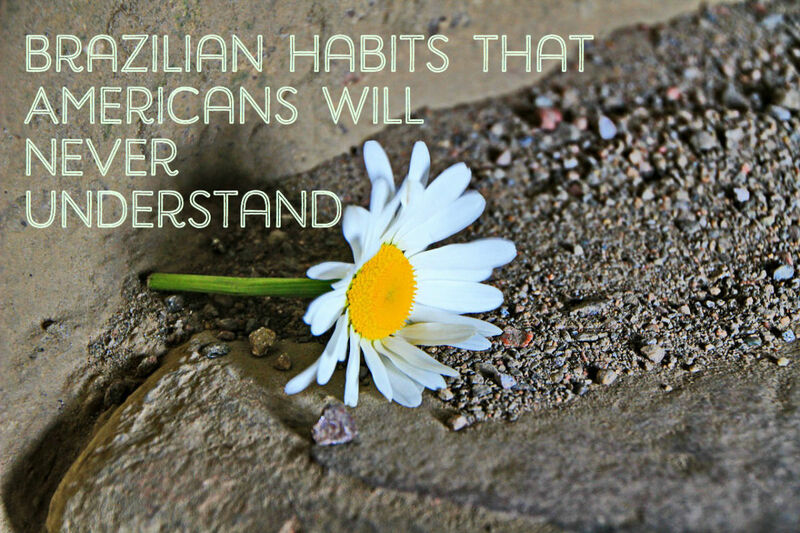 From my experiences most people in Sao Paulo don't have that much English but there are increasing numbers of younger Paulistanos who know English quite well and will help you out as best they can. Having a Portuguese phrase book handy is also a good idea! Bem vindo a Sao Paulo. A person born in Sao Paulo state is called a paulista, someone born in the city is a paulistano. 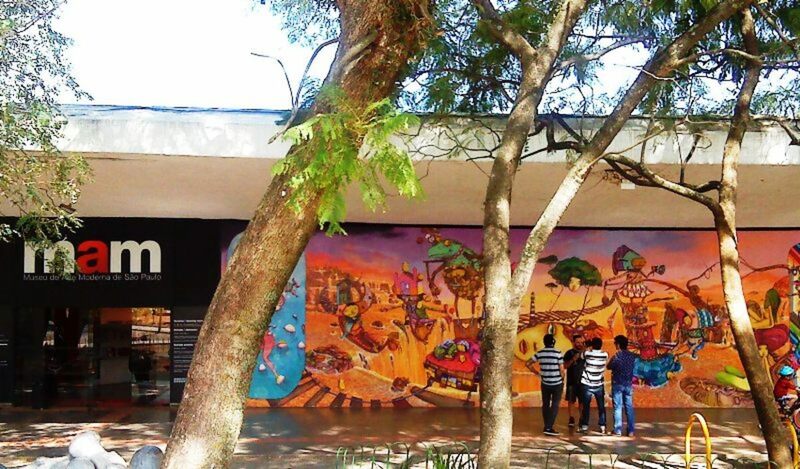 If you want to get to know about Sao Paulo from local experts then this free walking tour from the Tourist Information Center near Republica metro station is a must. There's a choice of two. The Old Downtown walk is probably best for those with 3-4 hours to spare as it includes lunch. Set off time is 11.30am. 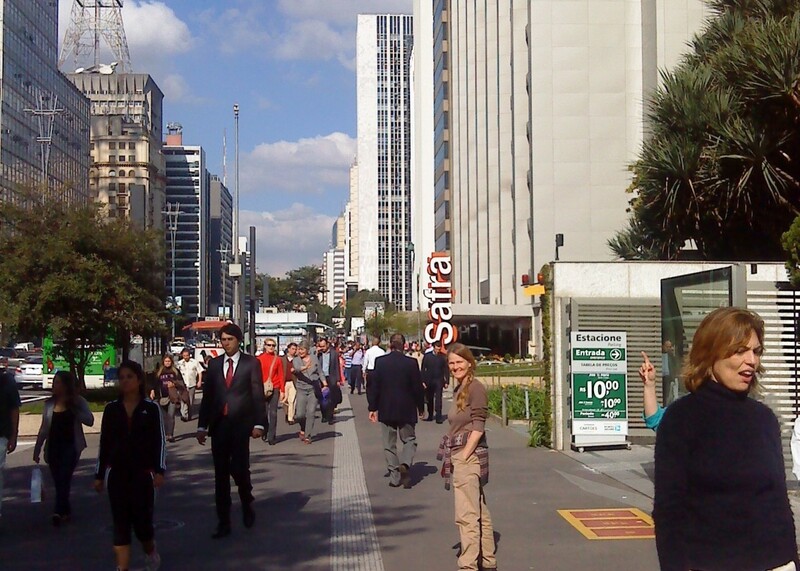 The Paulista Avenue walk is less strenuous and guides you through mostly modern surroundings. This starts at 3.30pm. All guides have microphones so you can hear everything they say. Languages are English and Portuguese. 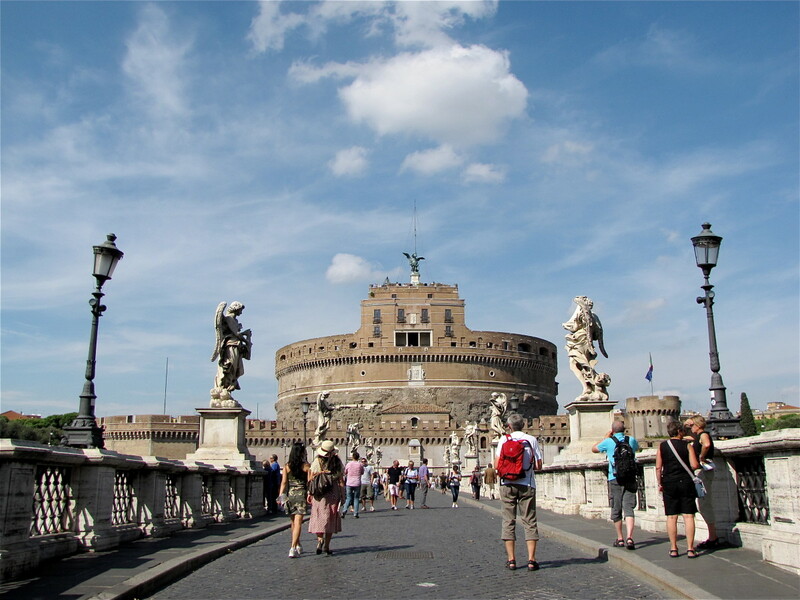 I'd recommend these walks because you'll learn about the history, the politics and get to know where the important places are in this vibrant city. Avenida Paulista, the main street of Sao Paulo. 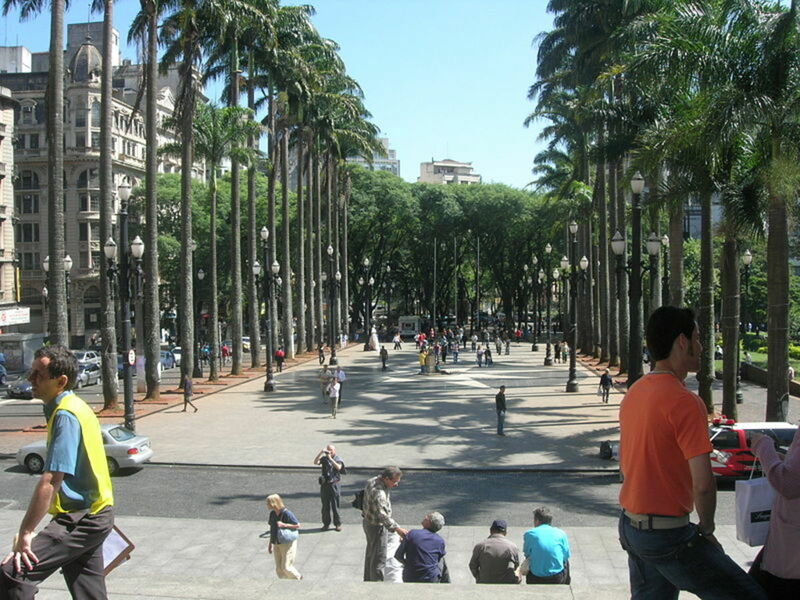 One of the world's biggest urban forests lies to the north of Sao Paulo city and is well worth a visit. 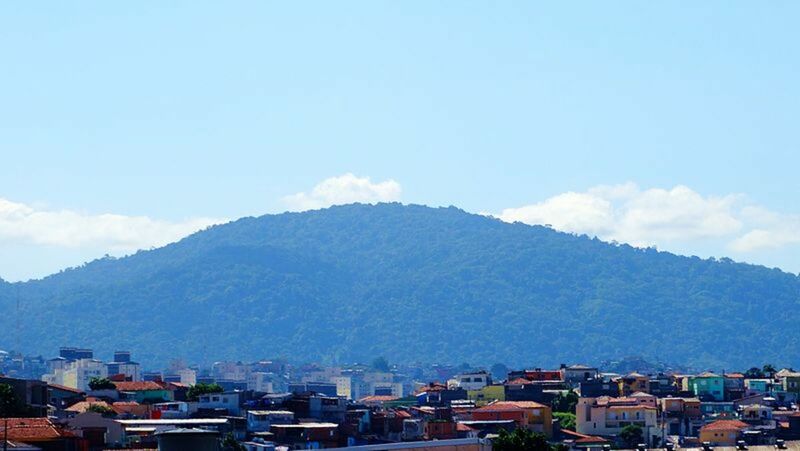 Not only do you get to see local populations of monkeys and birds as well as native species of flora but you'll have a fantastic view of the city if you climb high enough up the slopes of the Serra Cantareira. Walking and hiking are popular as there are many trails to follow, plus you're guaranteed peace and quiet away from the busy streets. Take some food with you for a picnic. If you're into biking there are some good tarmac tracks to venture down. Please note OPENS ONLY AT WEEKENDS AND HOLIDAYS so check first before heading out. Metro: Santana then taxi to above address. Bus 1018-10 Vila Rosa also stops on Rua do Horto. 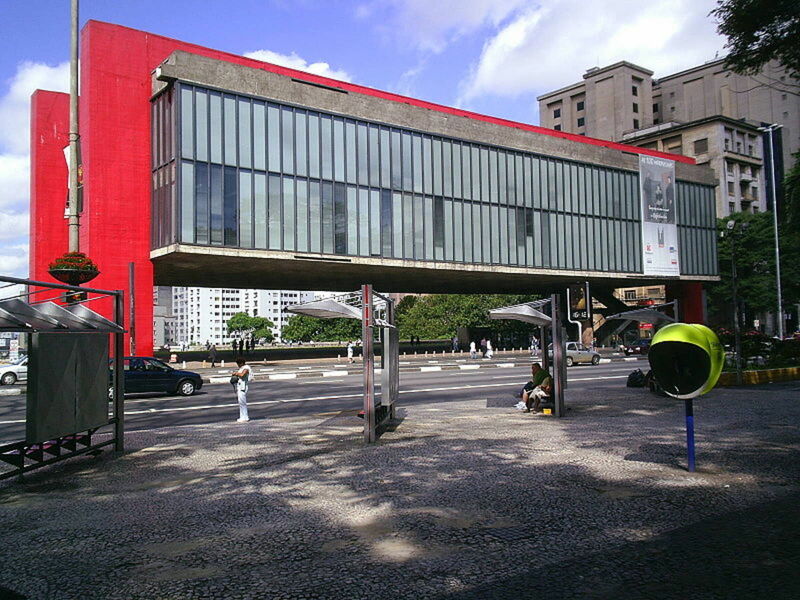 Designed by architect Lina Bo Bardi this 1968 building has become a landmark structure in Brazil, its striking red beams a special feature. The main body of the museum seems to float above the ground. Admittedly its starting to look its age now - concrete and glass are not timeless materials - but the exterior is only half the story! What's inside is what counts and there are many fine works of art to admire. Many of the great European artists are here: from Tintoretto to JMW Turner, from the French Impressionists to El Greco and Goya. As you'd expect Brazilian and South American art is also well represented. 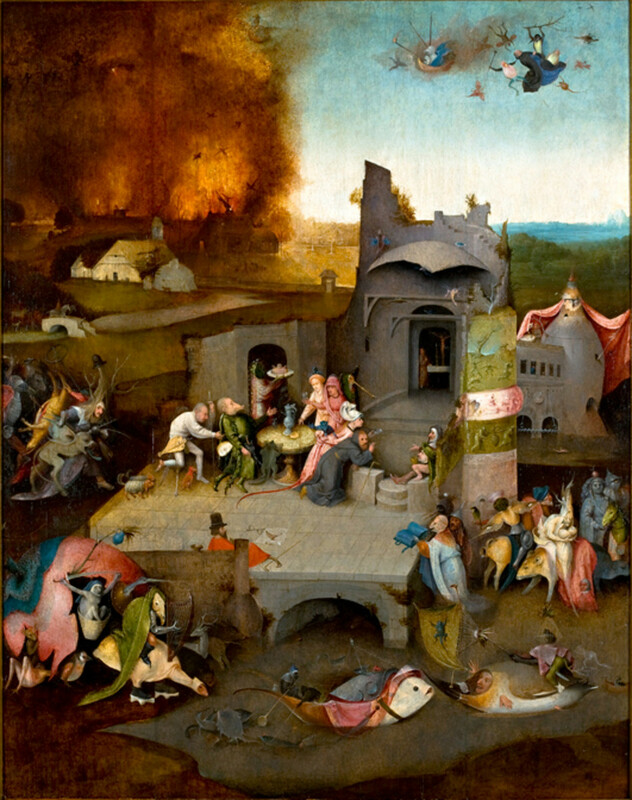 I spent a long time studying Hieronymous Bosch's The Temptation of Saint Anthony. A fascinating picture full of mysterious and surreal images. Local markets spring up all over Sao Paulo's suburbs but one you should definitely visit is the big one, the municipal market close to Luz station. Nicknamed the Mercadao it's the place for fruits, foods, meats, spices, herbs, the list goes on. Exotic fruits from all over Brazil end up here and you'll be enthusiastically served up samples as you pass the well stocked stalls. One word of advice - be absolutely certain of what you're buying and at what price. You could end up with a huge bill for what you've sampled, thinking they were all gratis!! Enjoy a Mortadella Sandwich for lunch or a pastel de bacalhau, they're good value at the many eateries inside the vast building. 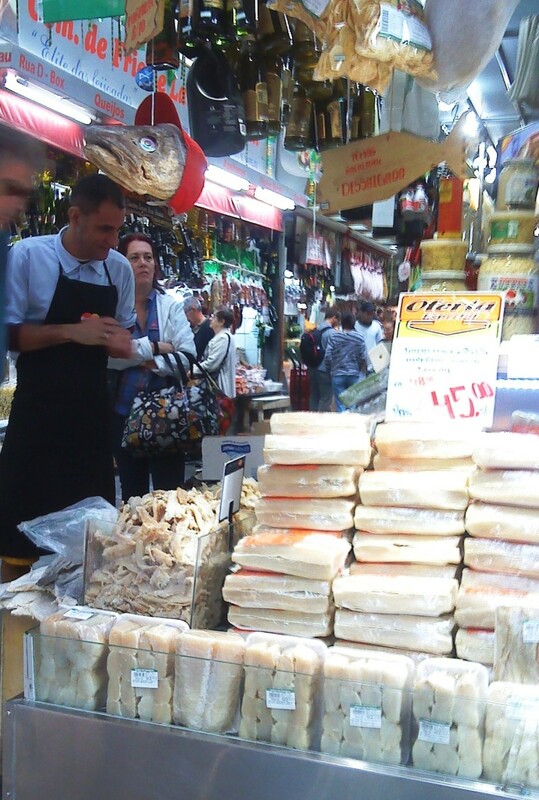 Sao Paulo market: A big pile of bacalhau. 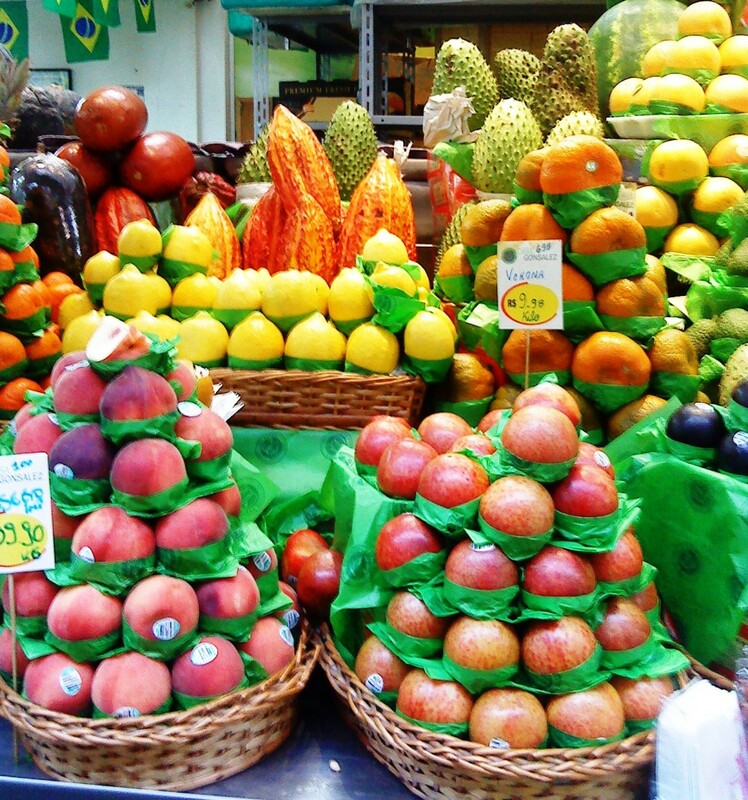 Fruits on display at Sao Paulo Municipal Market. 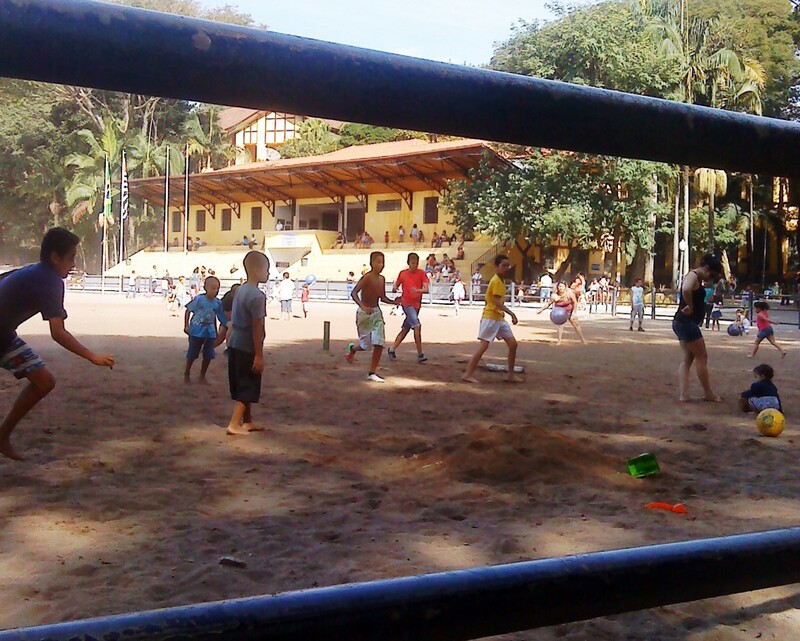 In Sao Paulo there are many small parks scattered around. They're usually clean, friendly and relaxed places where city folk go to sit and relax, eat some food, play with children, hear some music or entertain themselves. Parque Agua Branca is just such a place but what makes it different is the fact that it's full of animals - chickens, roosters and horses. The birds run free and the horses are kept in stables ready for horse riding lessons which take place in a sand arena. There are also some awesome trees in the arboretum, including the tree Brazil is named after, the Pau Brasil. Musicians also play here at the weekend (and weekdays sometimes) and there's lots of food to enjoy whilst listening. My friend's apartment block was right next to this park when I stayed, providing much sought after fresh air and space to run and feel free. In Sao Paulo they really take care of their parks, they're such a precious resource. 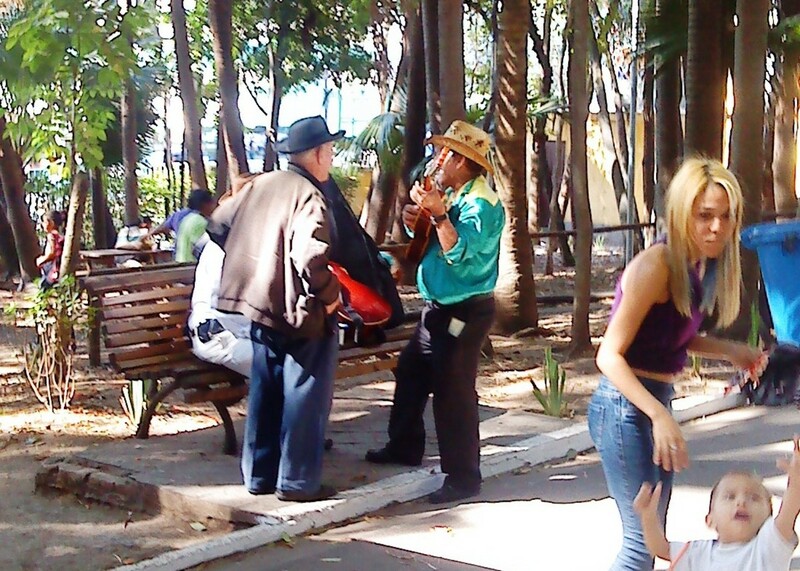 Musicians and family in Parque Agua Branca. 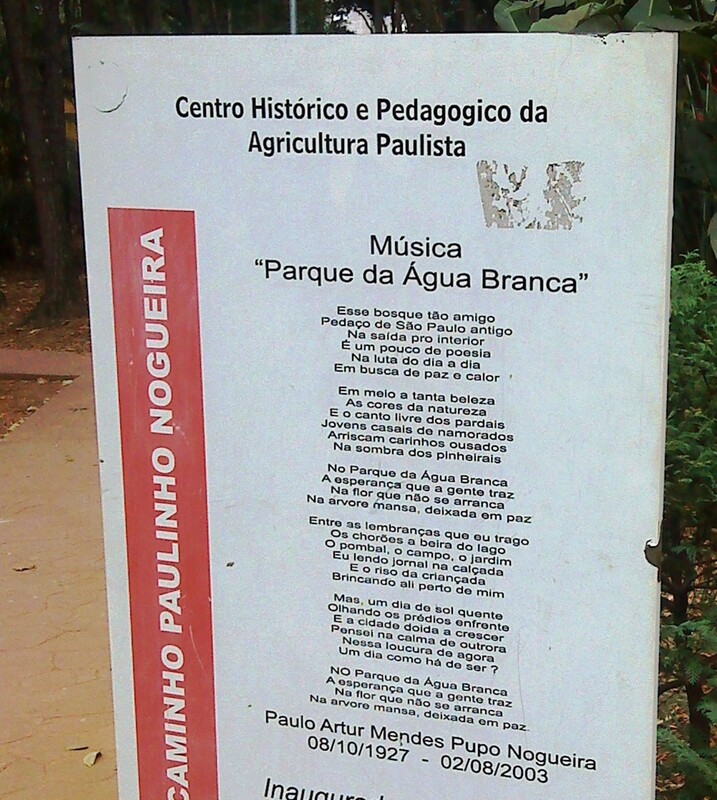 Song lyrics for Parque Agua Branca. Bacalhau is a Portuguese dish adopted by Brazilians and eaten all year round, especially at New Year. The Portuguese word bacalhau means cod but the name also pops up in over a thousand recipes. 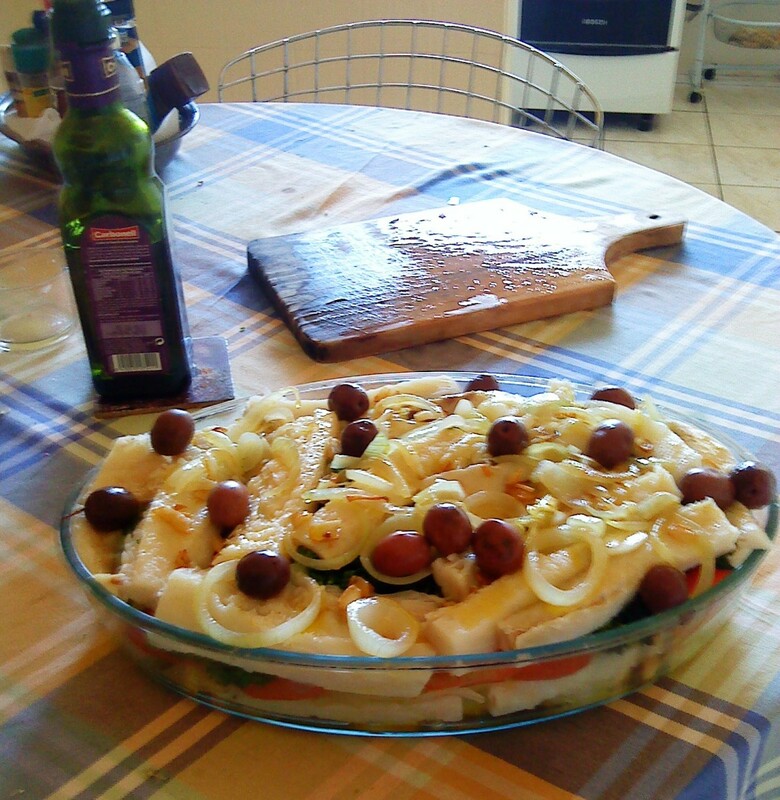 The basic dish contains potatoes, onions and olives plus tomatoes and herbs. This is what I had when my friend cooked the meal. Simple yet delicious served with white or green wine (vinho verde). It's available in many markets and stores, sold in various sized blocks. Or, if you cannot make it yourself, choose a nice restaurant, check the menu and settle down to authentic bacalhau cooked by an expert. If you're into football (soccer) then this museum will delight you. 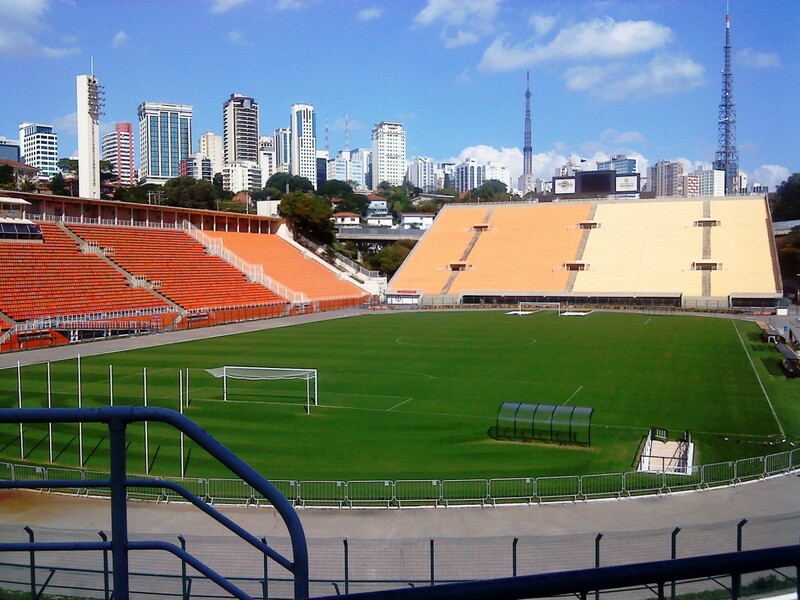 It's part of the Estadio do Pacaembu where one of the top clubs in Brazil - Corinthians - used to play. It's still active as it's used by the city for all kinds of different sports. Full of photographs, screens, interactive games and momentoes from the past you can also watch films and documentaries showing Brazilian football's great heroes and victories. Some of the exhibits are fascinating, like the photograph of the man who brought the beautiful game to Brazil, a British man called Charles Miller. World Cup aficionados will love it here. Bring your shooting boots and try the penalty shoot out competition! 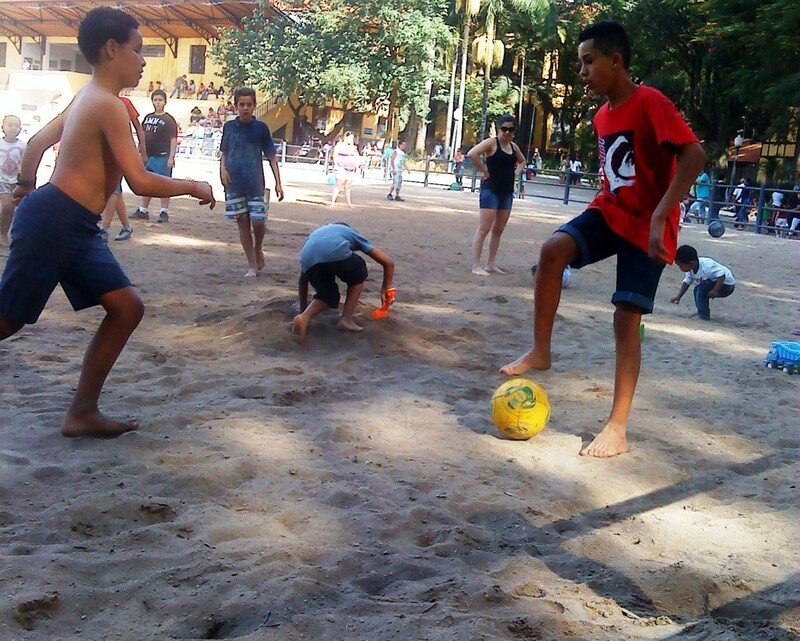 Sao Paulo boys with the football at their feet. The football museum is housed in this stadium. 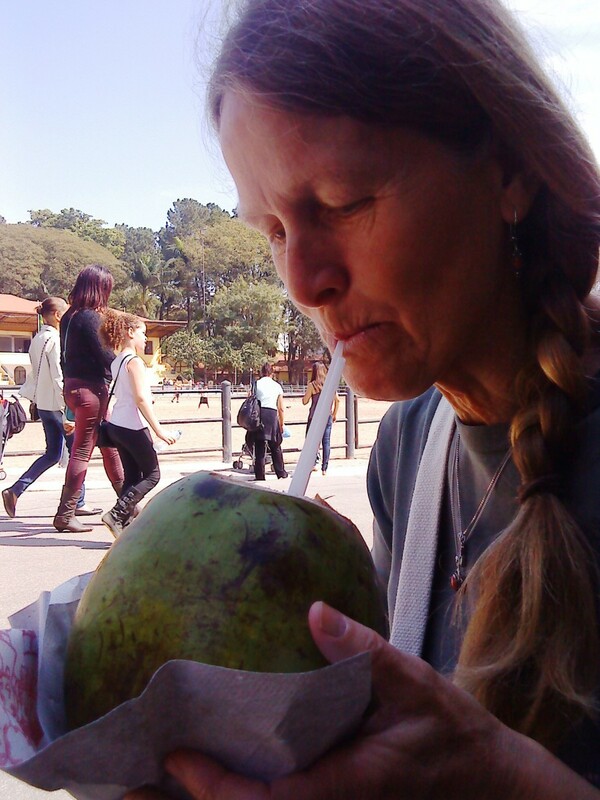 Drinking coco - fresh coconut milk, delicious. Everywhere you go in Sao Paulo you'll find Coco stalls, places where you can buy a fresh coconut, have it chopped and prepared ready for that sweet nutritious milk. It's one of the best drinks and relatively cheap at 4-5R$. 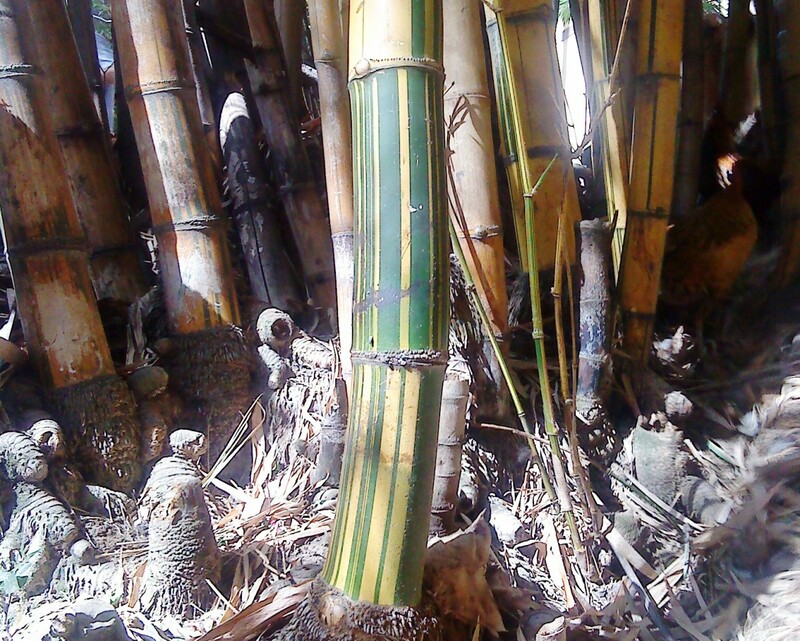 Often the coconuts are kept refridgerated so you'll enjoy a cold drink, especially welcome on hot humid days. Paulista Avenue is the main avenue in the city. Modern office blocks, high rise apartments and designer shops dominate so be prepared for a busy, hectic atmosphere. You'll be amongst businessmen and women, fashionistas and shoppers - just about everyone turns up on this most important thoroughfare. There are some older buildings in the shadows of cutting edge architecture. It's as if they want to say...Hey,hang on, don't move too fast, we've a story to tell. You can catch a bite to eat in one of the many bars and restaurants, or sit back with a coffee and watch them all go by. There's also a post office, correios, on this avenue, so you can buy a postcard or two, sit and write them with a drink then post them all in one go, the old fashioned snail mail way! Metro: Paraiso, Trianon MASP, Consolacao. 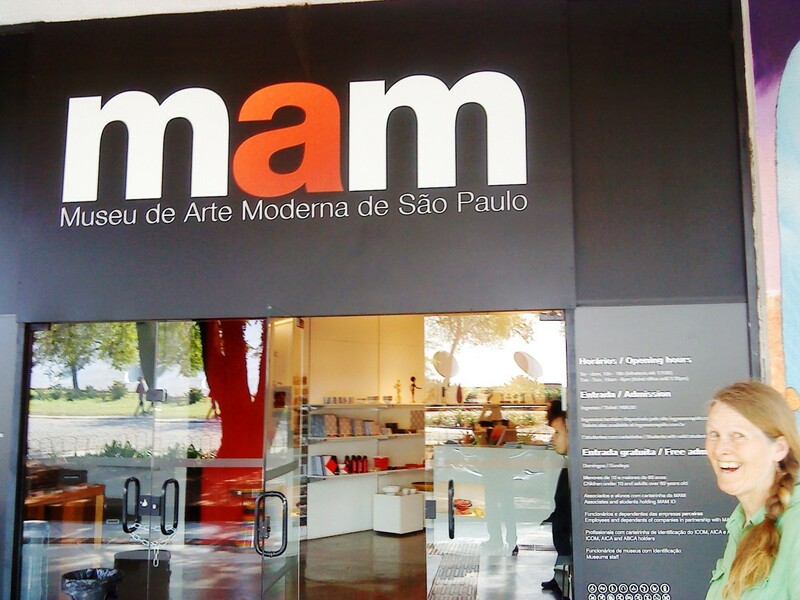 Not to be confused with MASP which is on Avenida Paulista, MAM is a little further on in Parque Ibiraquera. This is a smaller gallery and often exhibits younger unknown artists from Brazil and south America, although more famous establishment artists show here too. When we visited there were just two exhibits but it gave us time and space to really focus on the work. There's a cafe and restaurant giving you the chance to combine a meal with the art and then go exploring in the park afterwards. 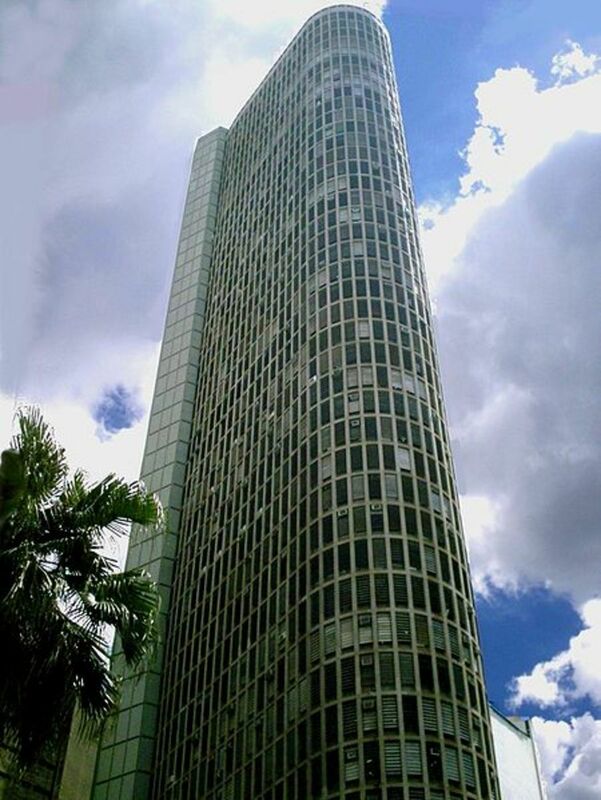 If you want the best view of Sao Paulo from the inside so to speak you have to climb high - that means going almost to the top of the Edificio Italia, all 46 floors of it. Once up there you can buy a drink at the observation bar or treat yourself to a meal in the plush restaurant and drink in the views only the vultures normally get! The menu isn't cheap but it makes for a unique experience. This is on the 41st floor. Saturday and Sunday afternoons are quiet. I was told that evenings are best, just when the sun is going down. You can buy one expensive drink, make it last, listen to live jazz and be warmed by the sunset over the city. The hotel we stayed at in Guarulhos, near the airport, had great views from the 22nd floor. You could swim in the open air pool whilst the rest of Sao Paulo went about its business. Unreal. 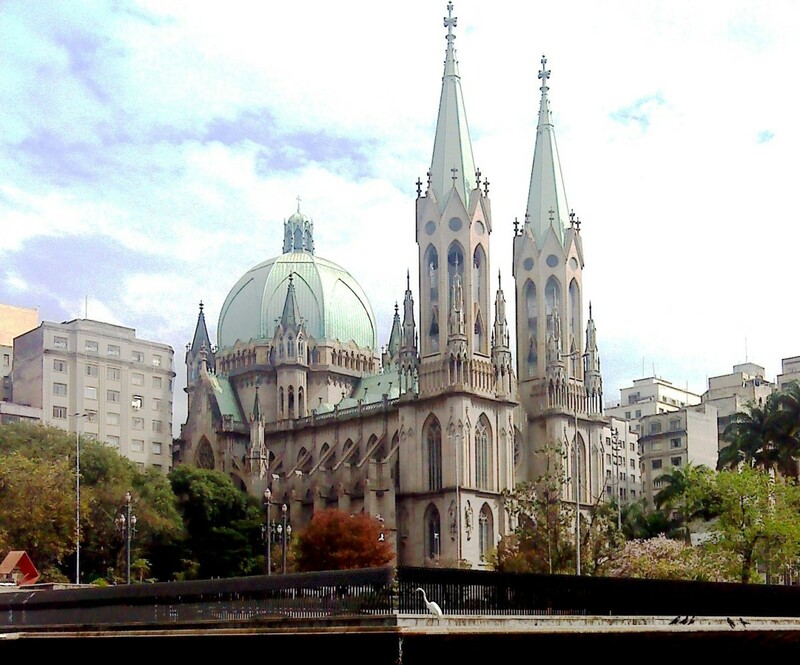 The Metropolitan Cathedral of Sao Paulo is at Se, the spiritual centre of the city. Finished in 1954 this is a modern looking church of light grey stone with some nice classical lines. Open most days there are regular services which you can attend. You simply walk in if you want to pray or meditate. My friend spent a good half hour inside whilst I took photographs outside. You may hear stories about the Praca de Se, close to the cathedral, of how it's dangerous and full of pickpockets and what not but we experienced no bother whatsoever on three visits. Yes you'll see homeless people and likely one or two evangelists, it's that sort of meeting place. There are some interesting book shops close by, we took time to search through some English language books before the smell of excellent coffee drifted our way from one of the small cafes. 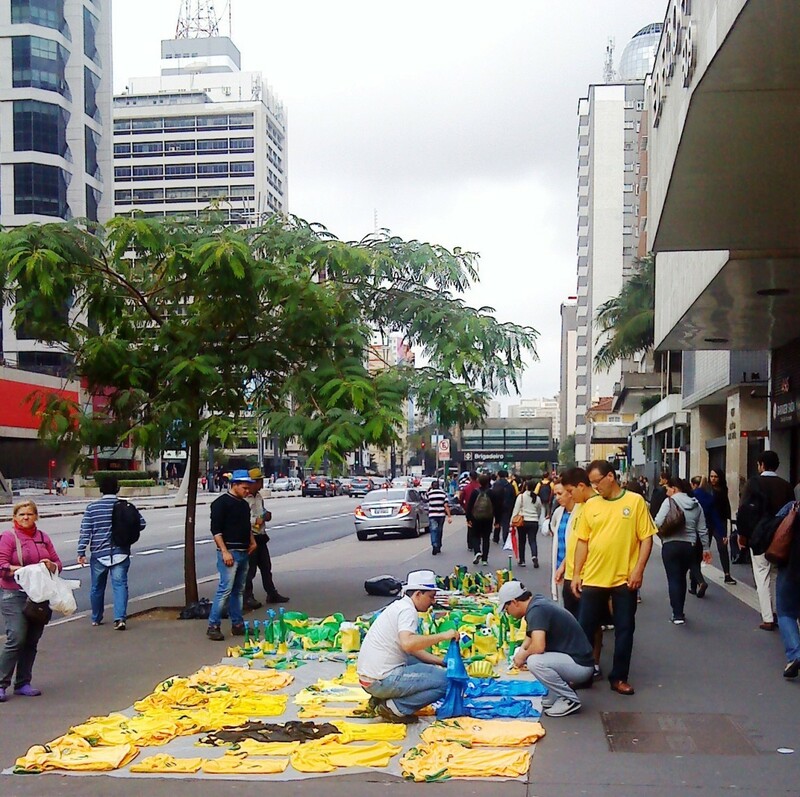 This is Sao Paulo's largest urban space and is very popular with Paulistenos. Here you'll find joggers, walkers, skaters and sporty types plus families and culture vultures. It's a park for all and has some great sculptures, spaces and trees. 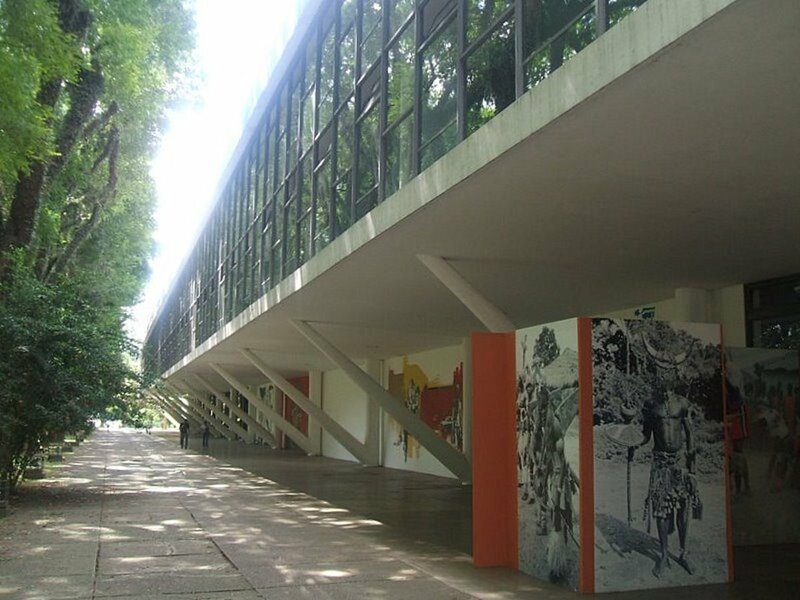 Ibirapuera also boasts the MAM and the Museum of AfroBrazil plus the music hall Auditorio Ibirapuera designed by Oscar Niemeyer the famous Brazilian architect. If you're looking to escape from the traffic and tarmac for the day this park offers a breathing space. Take a picnic, visit a gallery, chill out. 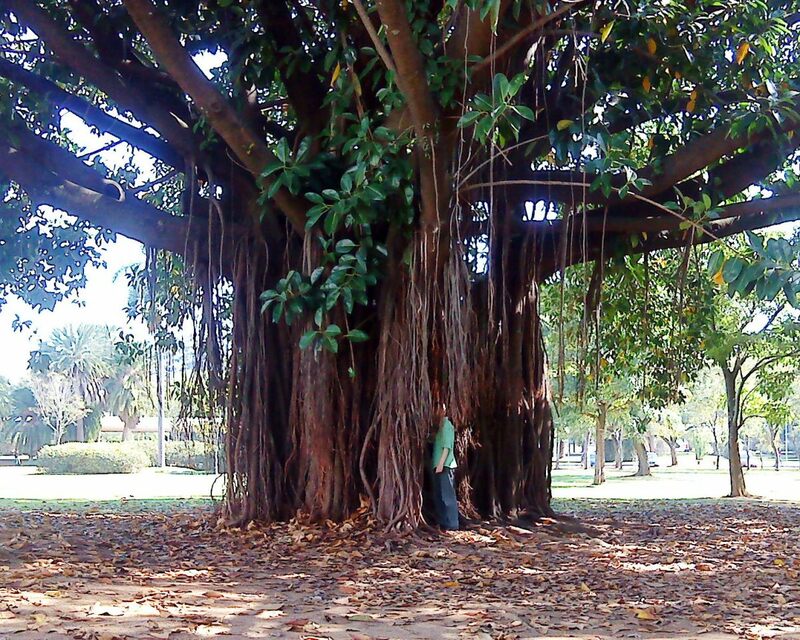 A magnificent tree in Ibirapuera. 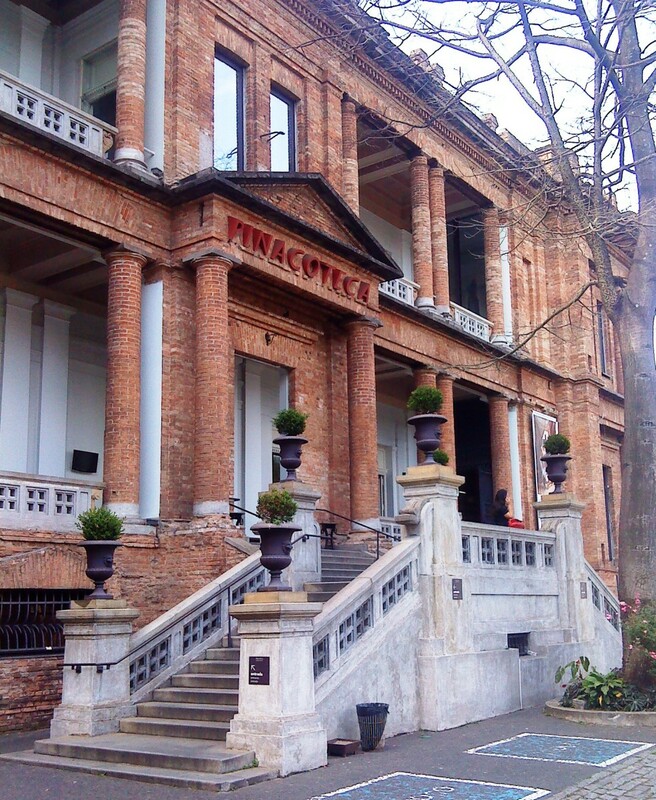 The Pinocoteca is one of the oldest art institutions in Brazil. It houses paintings, sculptures and other works of art from the 19th century up to modern day. If you want to know some of the history of Brazilian art yet be kept on your toes with cutting edge exhibitions this is the place to go. 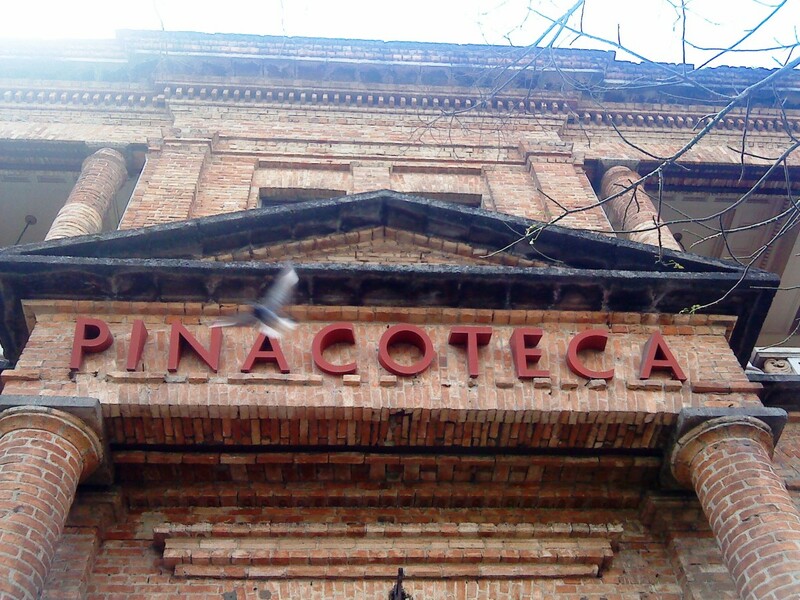 I was very impressed with the space and the relaxed atmosphere of the Pinocoteca. 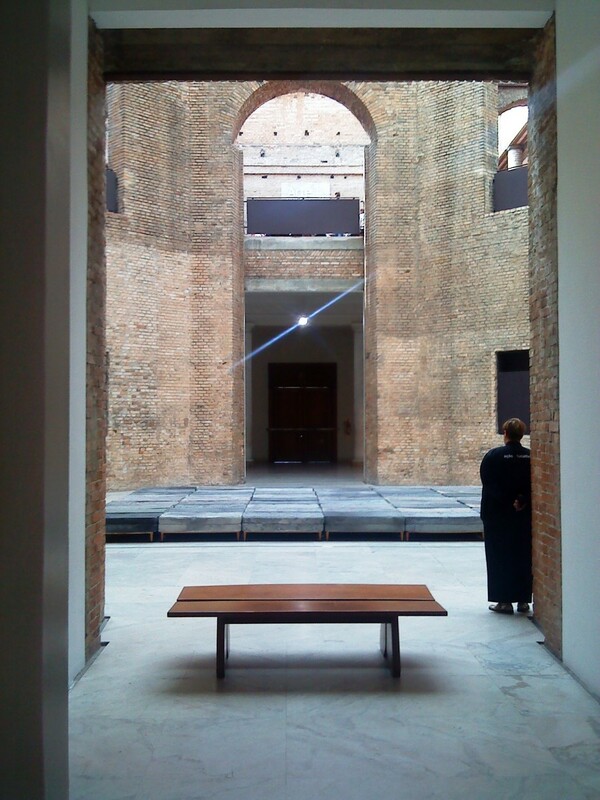 The high ceilings, classical plaster and exposed brickwork give it a curious feel. Is it older than 1897 or younger? We paid 6R$ to get in, a small amount. 15. Don't Miss the Nature! Being in a big city can blind you to Nature and what she has to offer, but I think there's much to see and admire in Sao Paulo. In the first few days of our visit we noticed quite a few birds flying around. For starters there are the dark vultures that float above the high rise blocks, looking out for a snack! They're quite common. 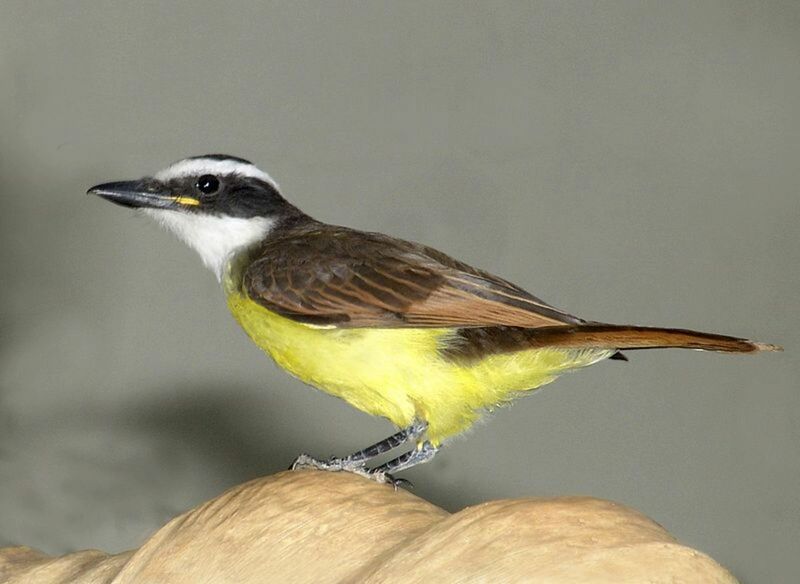 Another bird that caught our attention was the Great Kiskadee, a lively, noisy fella with a smart lemon plumage and a black and white head. In the many parks you'll see beautiful trees and exotic flowers and even on the streets there are strange and wonderful offerings. 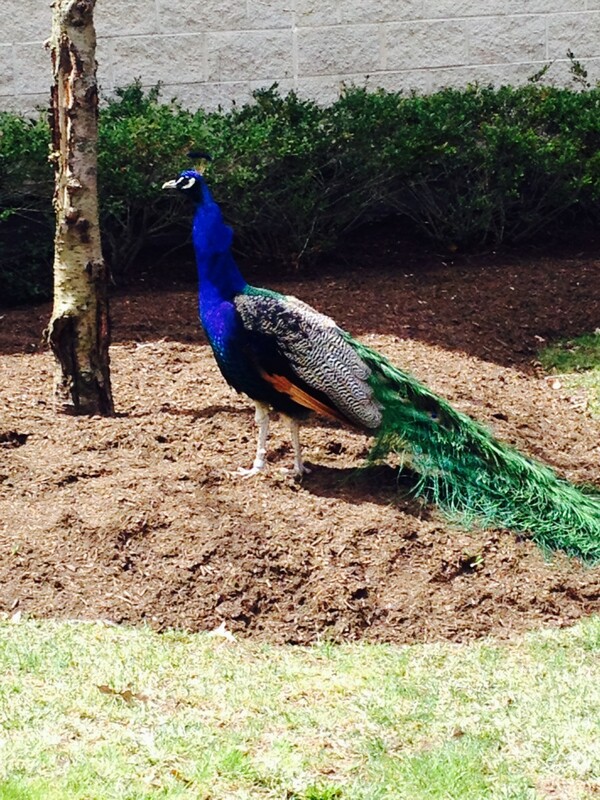 Keep your eyes wide open as you go about your daily business, there are hidden treasures awaiting. 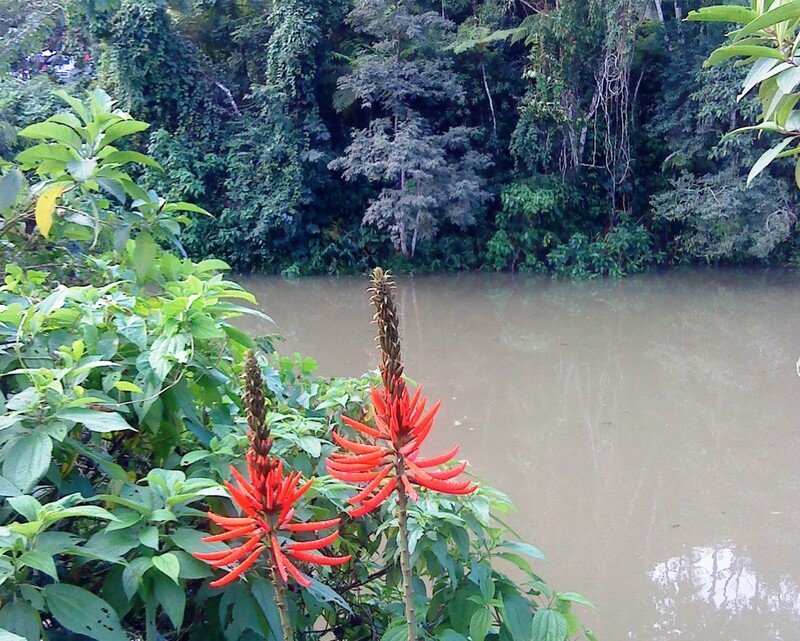 Look for birds, wild flowers and exotic shrubs and trees in the many parks of Sao Paulo. Bigger birds like vultures and raptors prefer the skyscrapers and the taller trees on the edge of the city. Exotic fruit on a tree in downtown Sao Paulo. 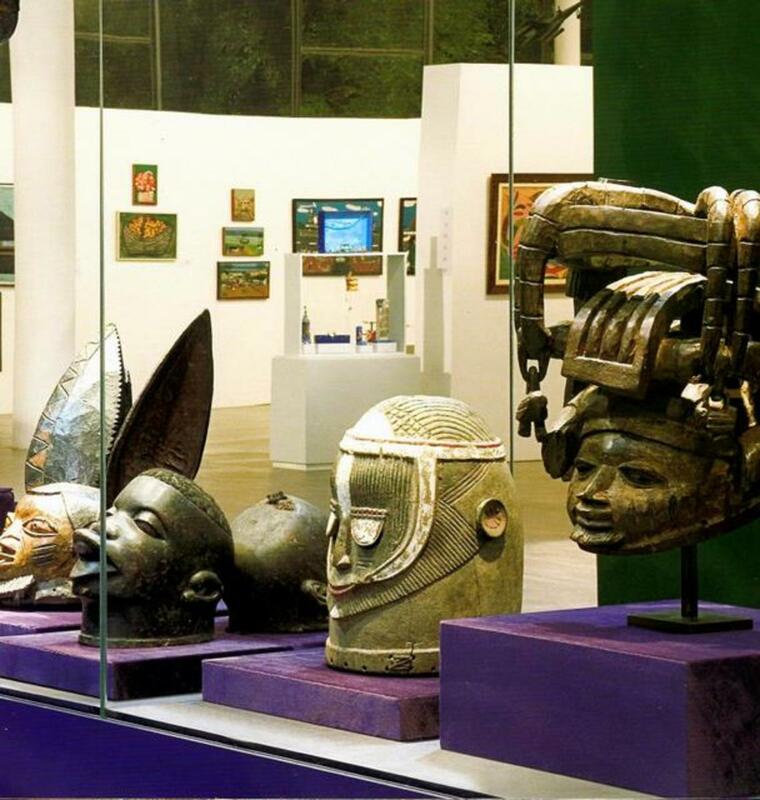 Situated in Parque Ibirapuera this museum gives you a strong sense of just how crucial a role African culture plays in Brazilian life. Definitely worth a visit as it helps put things into context through great displays of artefacts and other educational resources. Art plays a large part in the exhibitions and there's a history of slavery too. I think it's important to visit places like this in a country like Brazil - it has the largest number of descendants from Africa outside the African continent. Vila Madalena is packed with bars and fun places to hang out for an evening or more. It's the district to visit if you want to enjoy samba for example, at the O do Borogodo bar. You'll find beers, spirits and cocktails at the Sao Cristovao and SubAstor bars. A boteco is a typical city bar where you'll generally find the locals relaxing and refreshing themselves. Brazilian wine isn't up to much but there's a growing microbrew industry in the city supplying unusual beers. 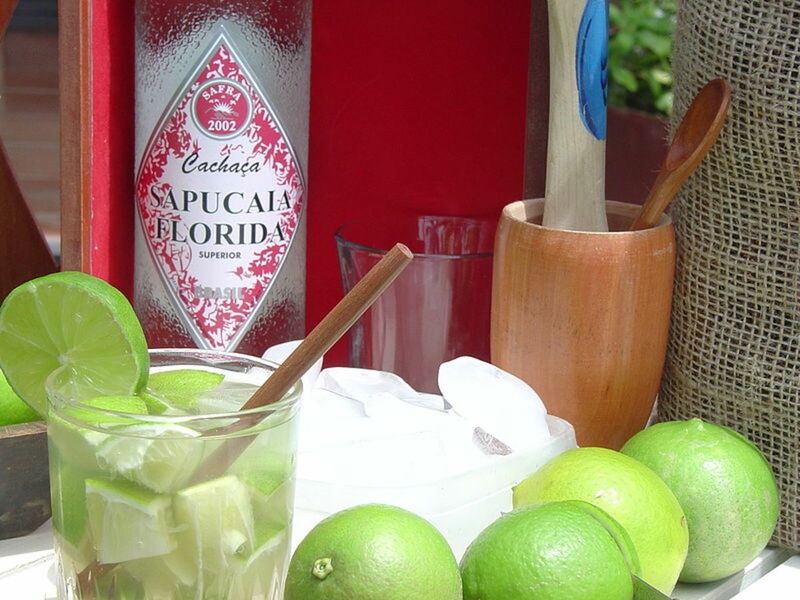 Take care with the aguadiente called cachaca, a clear strong spirit made from sugar cane. It's often part of the cocktail caipirinha, full of ice, lime juice sugar and cachaca. Be aware that very cheap cachaca, called pinga, can leave you a little worse for wear! 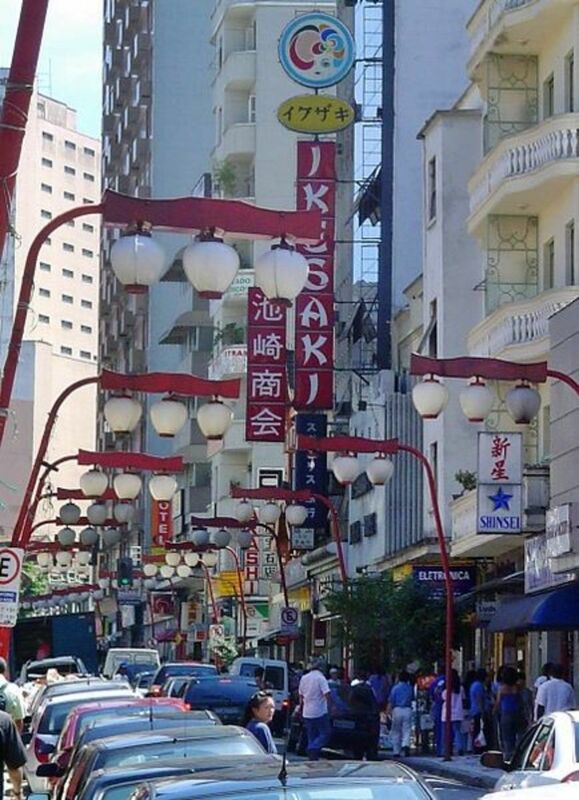 Sao Paulo is home to the biggest population of Japanese people outside of Japan, said to be somewhere over 1 million. Liberdade is the district where their culture is concentrated, hence Japantown, an area full of shops, bars and restaurants and Japanese atmosphere. The manga fanatics meet here also. So if it's food you seek like sushi or sushimi this is the place to go (besides Jardins, Itaim and Moema in town). You'll find a sprinkling of Korean and Chinese shops too. 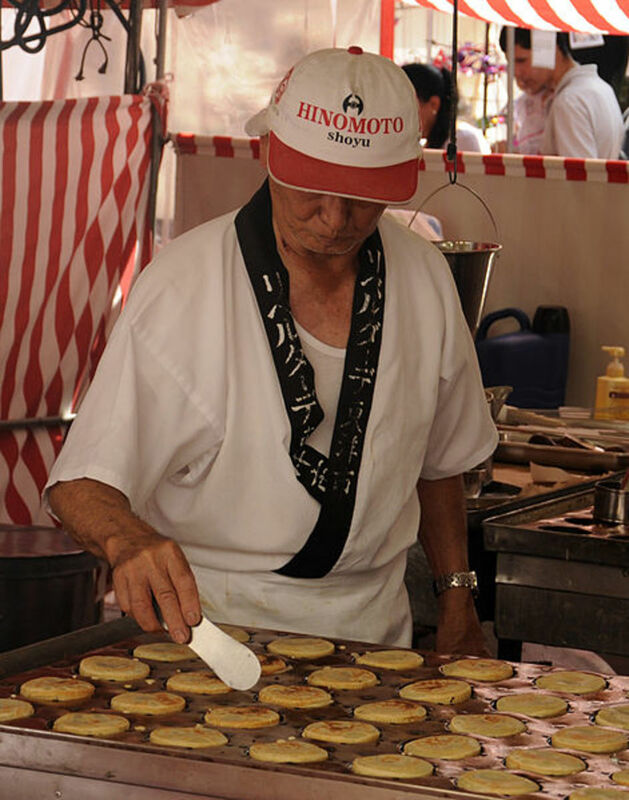 At weekends there are often special food fairs worth half a day at least and the markets Marukai and Casa Bueno are also great for special treats. Like to hear live music? Here are three possibilities ranging from classical to jazz. 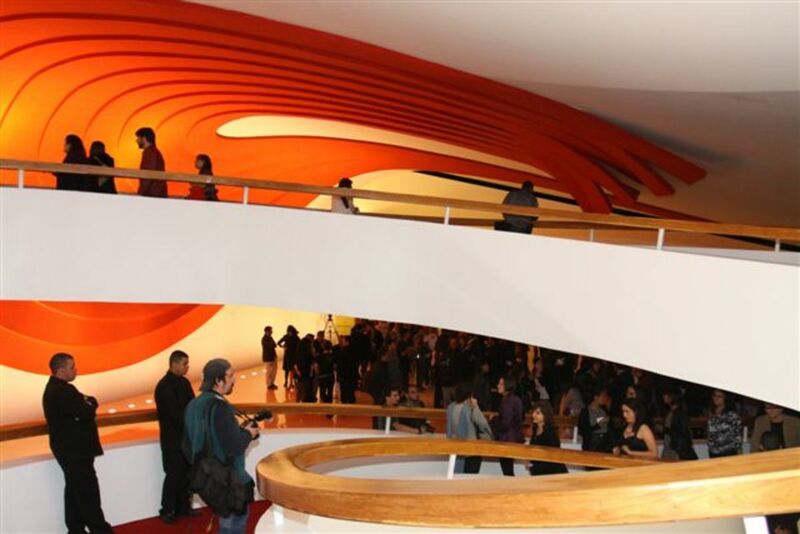 Auditorio Ibirapuera - this Oscar Niemeyer designed building is futuristic and holds free Sunday morning concerts. Bar Brahma - if it's samba you want to hear head down to the Brahma. Address: Corner of Avenidas Sao Joao and Ipiranga, Republica. Tom Jazz - this brick built large house is dedicated to jazz. Address: Avenida Angelica 2331, Hiegienopolis. Auditorio do Ibirapuera and the Obelisk. VW Beetle cars are common in Sao Paulo and have achieved iconic status. They were first made in 1953 but production stopped in 1986 because some thought they didn't meet safety standards. Fast forward to 1992. 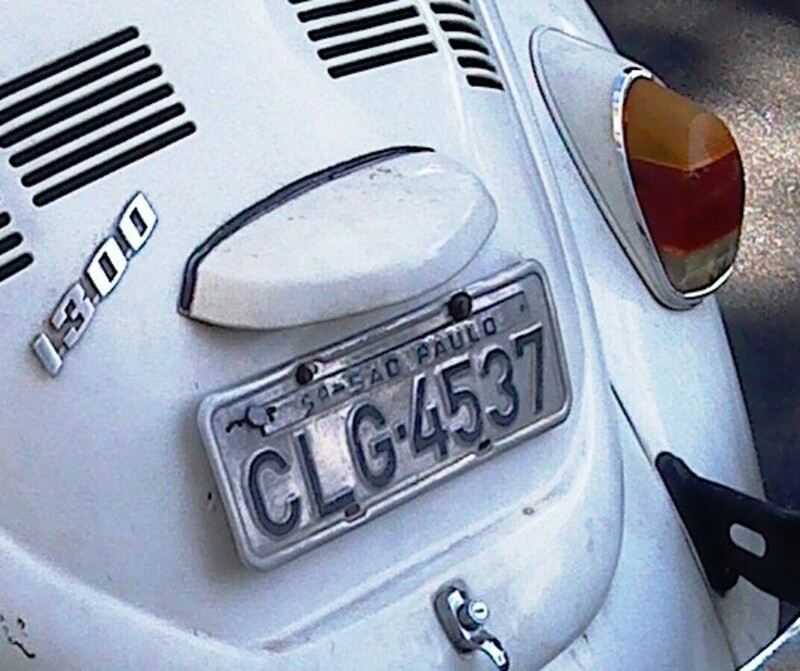 Then President Itamar Franco decided that a cheaper car should be available for the rising middle classes so instigated the rebirth of the Beetle (called a Fusca in Brazil). A new model emerged, still with air cooled engine and familiar insect shape. Some versions were called Alcool and could run on sugar cane alcohol fuel. Walking through this vast city you can often hear the Beetle first, especially older models, then it will pass you in the manner of Herbie. They are no longer made and have as a result become much ought after. 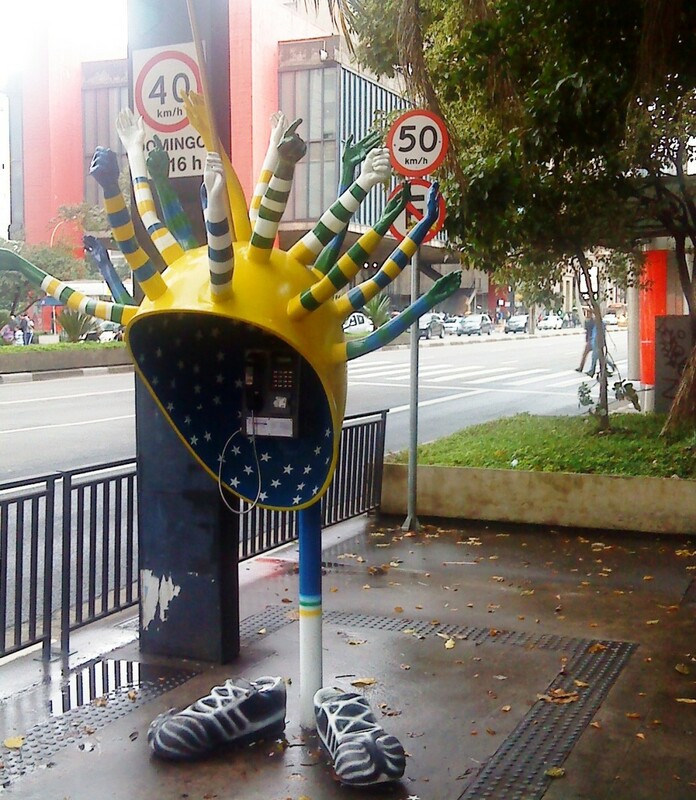 Also unique are the brightly coloured and designed public telephone booths. Look out for them, some are built for adults, some for children and those vertically challenged. 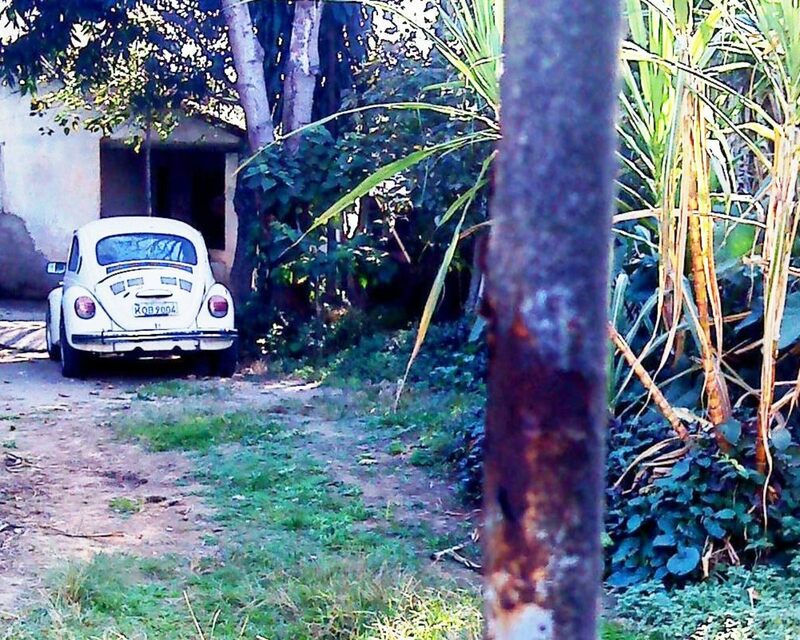 A VW Beetle hiding in a garden. Telephone booth with legs and shopping. This one has arms and hands and shoes. All images by chef-de-jour unless otherwise stated. Muito Obrigado. Sao Paulo - in my coracao. There is a lot to do in Sao Paulo! And, besides all you have mentioned, another great program is to visit one of its neighboring cities, Campinas! And to travel there, you only have to get a bus ticket at https://brazilbustravel.com/from-campinas-sp and enjoy it. I hope I helped… have a nice trip! Excellent news. Sao Paulo is such a big city so walking guides are definitely needed! Muito obrigado. 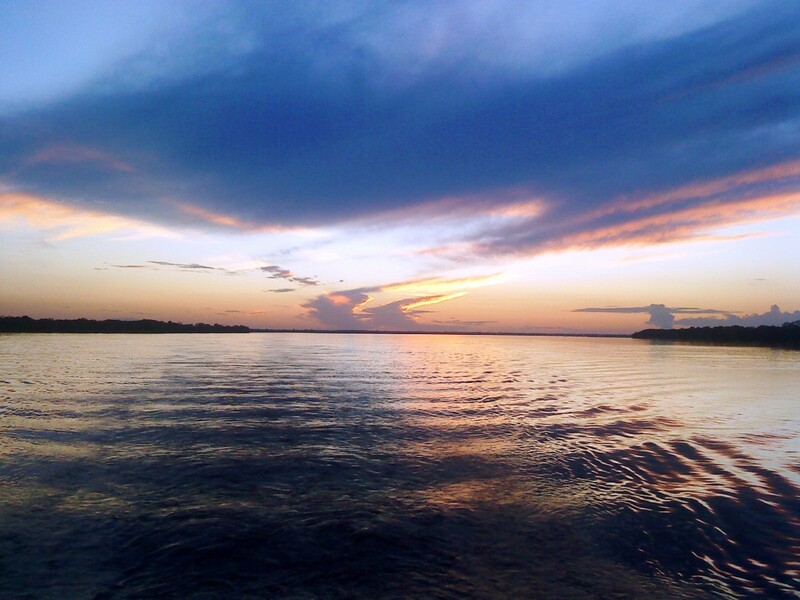 I took a boat from Tabatinga to Manaus, 1000 miles, 4 days, that brown river a god, churning, still a mystery. And the Pantanal - Rio Miranda - bursting with birdlife, a prolific waterland. For me the visit I had to Brazil goes on in my head and heart. Ciaou. I am paulistana, but Brazilians many times say "paulista" when referring to paulistanos :) You can say both, it's fine. You are friends with Jorge Amado's nephew? Wow! That's amazing! You have good and interesting friends in Brazil! I can only imagine what a great contrast it must have been to see the Pantanal and Amazonia right after SP, and being able to experience two very different facets of Brazil in the same trip. Very nice! Thank you, I appreciate your comment. So you are a paulisteno? Or paulista? I loved being in SP, staying with my good friend the journalist Roberto Amado (nephew of the great writer Jorge Amado) near to Paque Aguabranca - not far from Barra Funda - and immersing myself in the culture of your country. 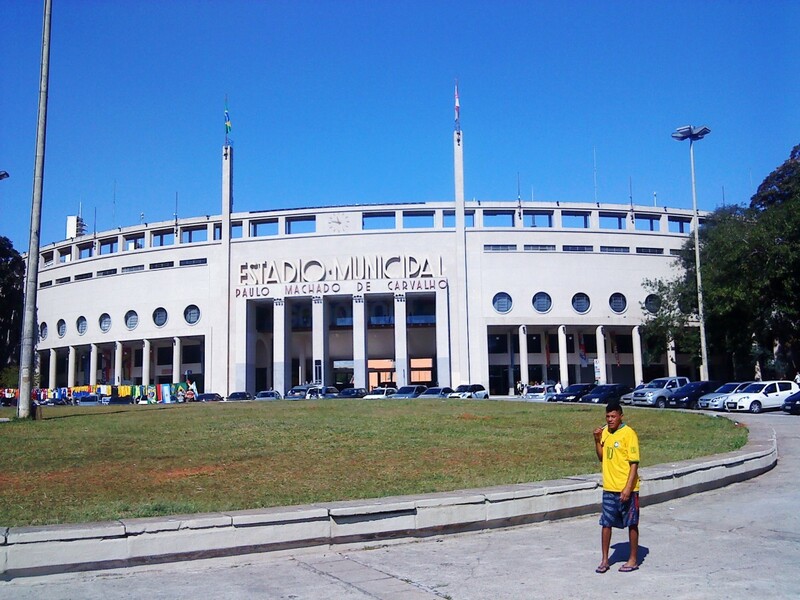 Of course, watching the futebol of the Copa was also very emotional!!! Such passion, such beauty. SP is a very BIG city!! It took my breath away. And after the city I went to the Amazon and the Pantanal.Imagine such places! Phenomenal. Unforgettable. Thanks for the visit. Brazil is vast, chaotic and exotic. Colleen - thank you for the supportive comment. I admit I also got a shock when I saw Sao Paulo stretching out in front of me from the top of the hotel. 360 degrees. A giant of a place! When one thinks of Brazil we tend to think of Rio. I never realized that Sao Paulo is the biggest city. You have covered everything needed to know before a holiday there. Great hub. Anita - thank you for visiting Sao Paulo and letting me know about jackfruit! So many exotic fruits in the warmer countries. Great hub and congratulations on the Editor's Choice award for this. Great photos too. That exotic fruit is actually jackfruit - very common in India. We eat it when it's ripe and also use the raw jackfruit in curries. gmwilliams - thanks for dropping by and leaving such a supportive comment. word55 - thank you for the supportive comment, much appreciated. alison - thank you for the comment and information. I came across so many 'new' fruits in south America I lost count! 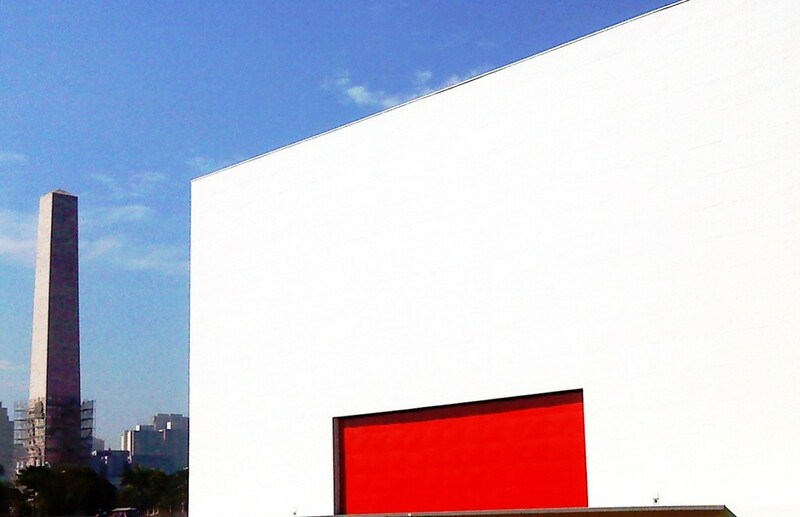 This is a very educational and interesting hub regarding Sao Paulo. It also draws the reader in and piques his/her interest. Brazil is one of the most fascinating and intriguing countries in the world. I especially loved the part regarding the Afro museum. Brazil has the largest African descendant population outside of Africa. Excellent hub, voted up! Very nice coverage and presentation of Brazil. I enjoyed the entire hub. Thank you for sharing and congrats on HOTD! 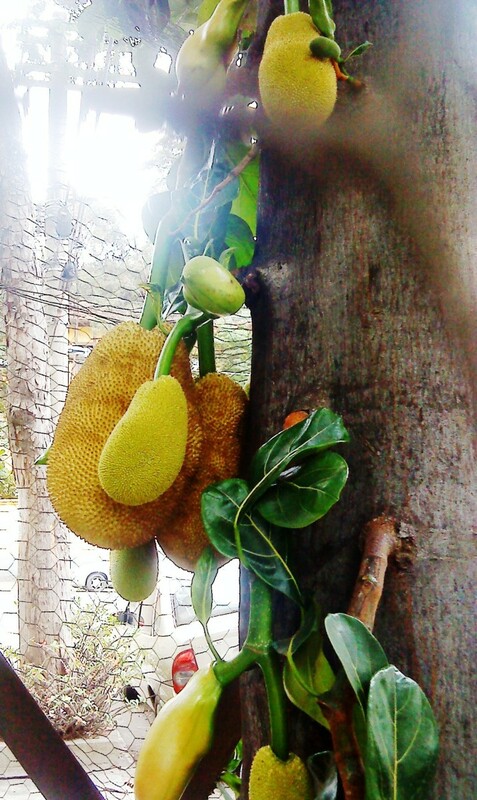 The fruit look like "jaca." A lovely pile of bacalhau, brings back memories. techygran - thank you for the visit, I really appreciate it. Yes, most Brazilians have a strong zest for life no doubt!! They're usually warm, expressive sort of people. Congrats on HOTD ! Informative hub with great pictures . Thank you Susan, really appreciate your visit and supportive comment. Daisy Mariposa - how kind of you to comment, thank you. Next time you visit Brazil perhaps you'll pop in to Sao Paulo!? It is indeed a very informative and visually appealing hub. Enjoyed the tour very much. Voted up and pinned on my travel board! Incredible article and one of the places on my personal bucket list to visit. My parents did visit there several years ago and loved it. Congrats and well-deserved on winning the Hub of the Day award. 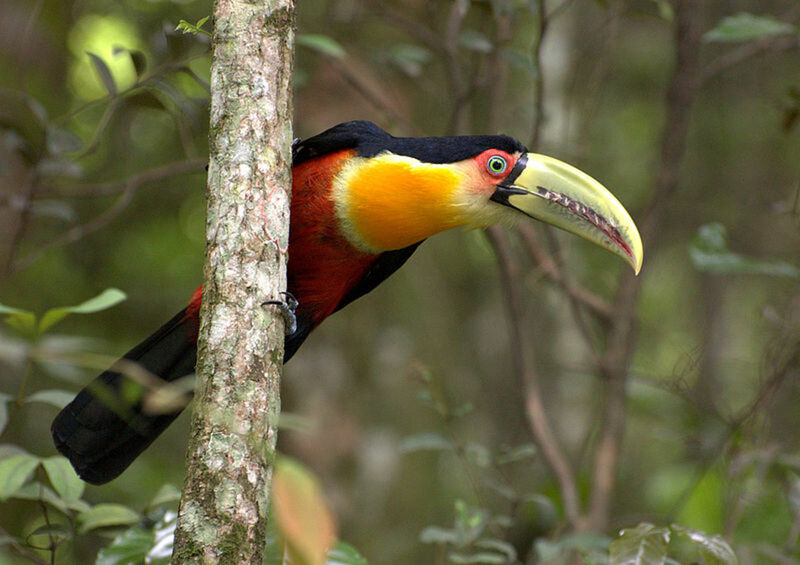 Your picture of the toucan is my favorite. So vivid! I'm sure Sao Paulo would be an amazing place to visit. Thanks for the tour. You're a great guide! Congrats, too, on HOTD honors today. Congratulations for having the September 21, 2014 HubPages Hub of the Day! I've been to Brazil, but not to Sao Paulo. Thanks for the virtual tour. Randy - appreciate your visit and comment, thank you. Tamara14 - thank you for the comment, I appreciate it. Sao Paulo is a vast, crazy city but one not to be missed if you're ever in Brazil! Breathtaking photos and a very good read, thank you. Articles like this one make me want to visit immediately :) Much more fun to read than a travel guide too. Congratulations! Great tour of São Paulo. Hopefully I'll get to put this hub to use some day. Love the photos. Great job and congrats on the HTD. Suzanne thank you, I really appreciate your visit. Sao Paulo is an exceptionally big city - best to have a plan worked out! Those selections are good enough to convince us that Sau Paolo is one excellent choice for holidays. Thanks, and congrats on your HotD! 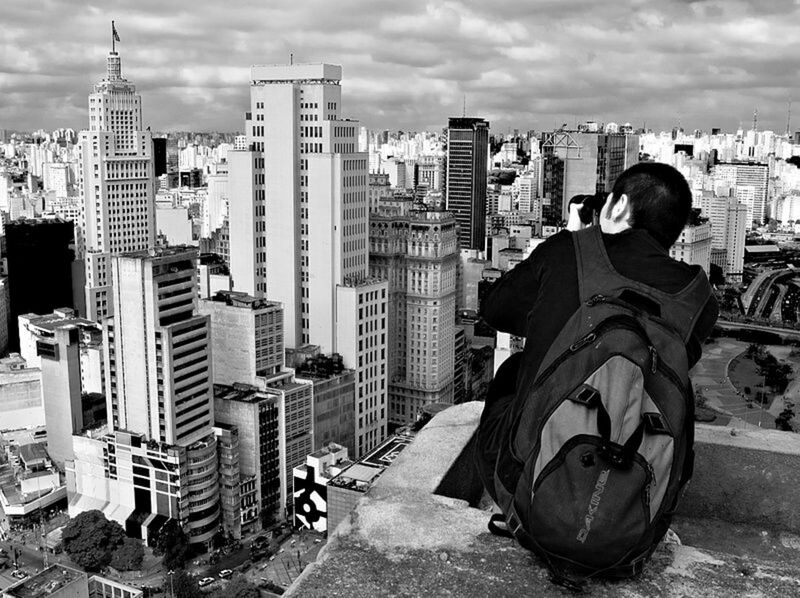 This is a very well written hub about Sao Paulo. Though I've never been there, I reckon I'd try out the dried cod fish meal, a city walk, the Museu de Arte de Sao Paulo for a pleasant afternoon, followed by Vila Madalena for drinks with friends. I really like your photos - well done on an outstanding city article! Voted awesome, up and submitted for HOTD. Thank you for the visit and comment Dianna. Sao Paulo has such a wealth of treasures - the markets especially worth their weight in gold! You make me want to visit soon. I loved the fruit display and the cod dish photo. I can see that the skies are truly a beautiful blue but I believe the entire city is just as lovely. Thank you for the visit and comment, appreciate it. Food markets are special. I support them whenever I can. Sao Paulo has some wonderful markets. AliciaC thank you so much for the visit and comment, much appreciated. 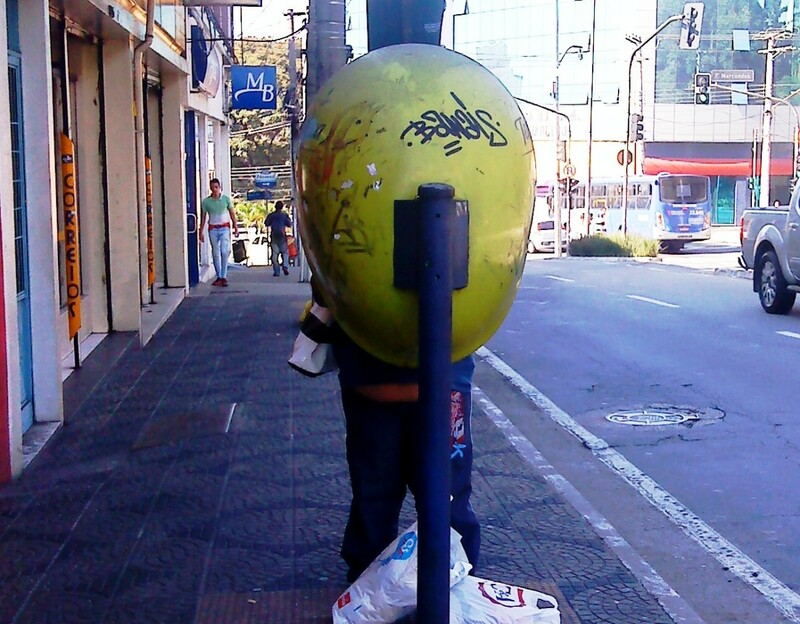 Yes, Sao Paulo is more than big as a city, busy and hard working and a bit crazy in parts - ok, very crazy in a few places. Being in Brazil was a special treat, a one off, holiday of a lifetime. I think it would be such a thrill walking through street markets and just trying the local produce and casual foods. This is a very enjoyable and informative article! I loved the descriptions and the photos. I may never visit Brazil, so I appreciate the virtual tour very much. I'll share the hub. 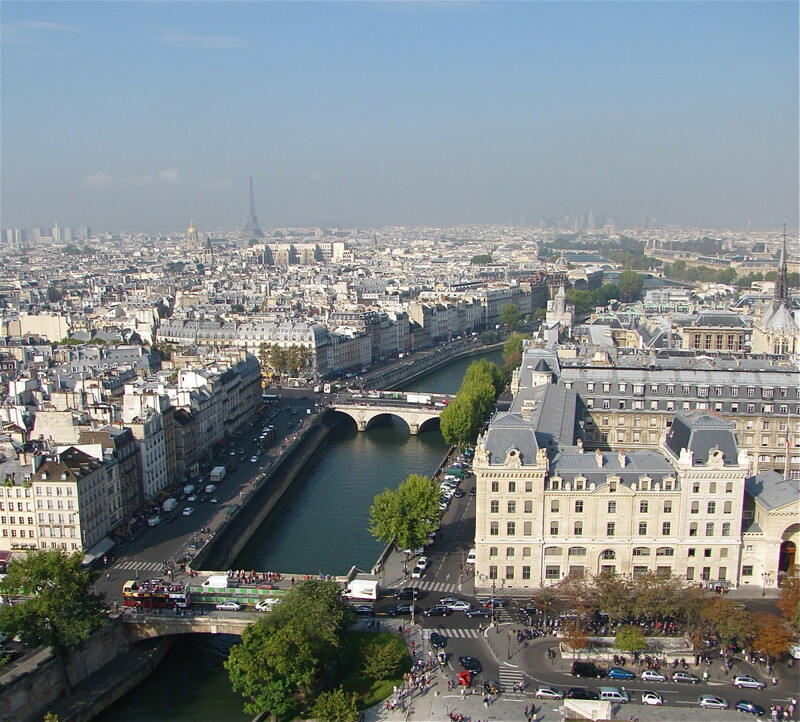 Imogen this city is seriously big and needs special planning ahead for maximum enjoyment! Having a local friend to show us the ropes was a blessing I admit. Lots of things to do and see - so glad you visited, I appreciate it. 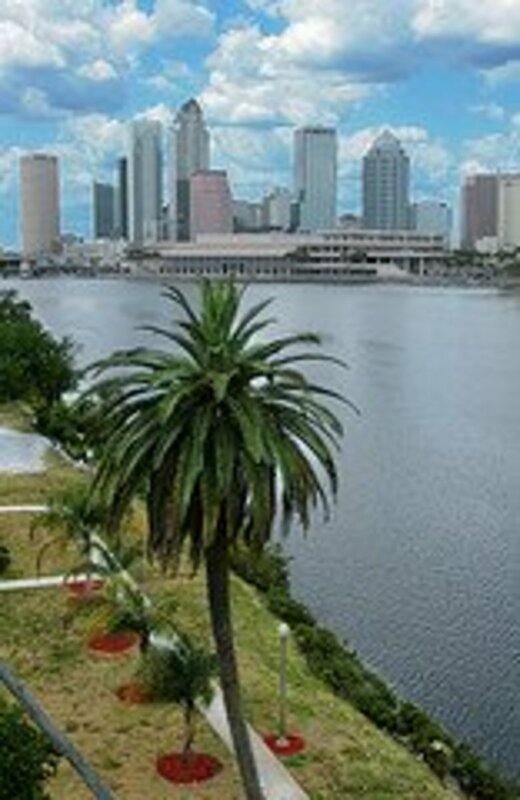 This is a fantastic guide to what looks like a really vibrant and exciting city. Great tips and wonderful pictures - it almost makes me want to get up and book a plane ticket! Thank you for the visit, much appreciated. Yes I was there in SP for the build up and the final so witnessed the Germany match and the depression that followed that shock result. Elation when they beat Colombia, reality check against the Deutschers and the Dutch. But Brazil is still futebol mad and probably always will be. Great read! We're you there before/during/after the World Cup as would have imagined that would have impacted the atmosphere at times!